I wanted to inform you of a few changes around the facility this summer. With all of these changes, I have thought deeply about them and consulted the necessary parties to ask for their input. The pastor’s office moving to the parlor. Many of you have already seen this move. The goal of this was simple – accessibility. I am a big believer that having an open door policy for permanent community and students to simply stop in and talk is key to building community. I experienced last year that many new students are intimidated by the office set up and how to find the priest or staff they are looking for. This decision was confirmed for me when I asked a group of students to help me move the furniture from Monsignor’s old office to the parlor. Not one of these sophomores or juniors had ever been past the secretary’s office and didn’t even know that we had offices! Reorientation of the Daily Mass/Crucifixion Chapel – It’s always a good problem when too many people are going to church! That is the situation we found ourselves in for a number of daily Masses last year, particularly with the student Mass on Tuesday nights. Due to this, we will be reorienting the chapel to increase seating capacity and thus make it more conducive to a larger crowd. To add seating, we will be using some of the chairs along the back wall of the church. It struck me as a little strange in my first year that our students have 24/7 access to the Newman rooms and Zak lounge for study and recreation, but not 24/7 access to a place to pray. I received a number of requests from students last year that they have access before we open at 11am and after we lock up at 5pm for a place they know will be open for prayer. Thus, we will be installing a keypad on the doors outside the Blessed Sacrament Chapel that will have the same code as the keypads to enter the Newman rooms. 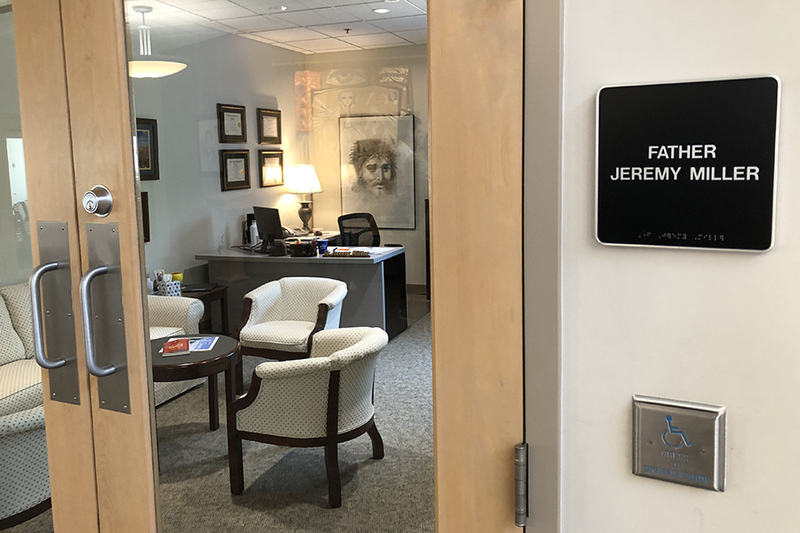 The doors at the end of that hallway leading to the narthex will be replaced with doors similar to the ones that lock the DeBenedetti room and the Newman rooms. The alarm, of course, will be disengaged in that part of the building. This change is not just for students, however; it is to guarantee for our parishioners, permanent community members and students alike, that outside office hours, there will always be a place to pray in front of the Blessed Sacrament. I know change is always difficult. I hope you understand that I only make these changes with deep thought and consultation with others. If you have any concerns about these changes, or things that I may have overlooked, please feel free to discuss those with me. Thanks in advance for your flexibility.